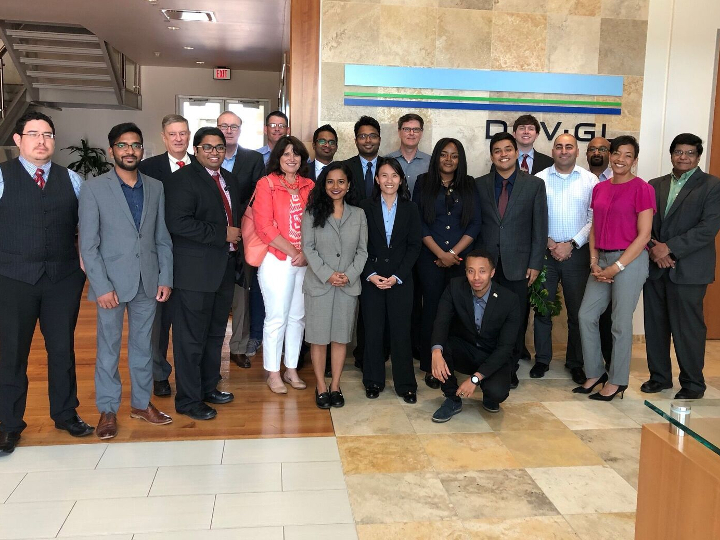 Students from across the University of Houston gained real-world experience in an interdisciplinary competition sponsored by UH Energy and DNV GL. An interdisciplinary team of students from the University of Houston captured the $6,000 top prize in a competition designed to find ways to minimize the risks faced by the Gulf coast petrochemical and refining industry during extreme rainfall events in the wake of Hurricane Harvey. Almost 25 percent of Gulf coast refining capacity was knocked offline by Harvey, and several Houston-area plants reported spills and unplanned emissions during and after the storm. The competition, sponsored by UH Energy and DNV GL, a global quality assurance and risk management company, asked students for ways to reduce plant downtime and limit legal and environmental liability during future storms. The winning team recommended structural and legal changes for the downstream industry, along with shifts in human resources and corporate communications. Both graduate and undergraduate students from a mix of disciplines – including engineering, business and law – participated in the project, which kicked off in the spring. Four teams presented their solutions earlier this month before a panel of judges. In addition to the winning team’s $6,000 prize, the second- and third-place teams received $4,000 and $2,000 respectively. Dana Nguyen, a chemical engineering major set to graduate next spring, said the students also gained real-life experience. That is a key goal of the annual interdisciplinary competition – students tackle a different problem each year – which grew out of a recommendation from the University’s Energy Advisory Board that students planning for careers in the energy industry gain experience in interdisciplinary teams before graduation. “The enthusiasm and inherent creativity among the students, especially when they came together as multi-disciplinary groups, was the highlight of this project,” said Murthy Divakaruni, director of special projects for UH Energy. In addition to Nguyen, team members included Adeyinka Abigail Aremo, a subsea engineering student; David Carter Dickson, law; Jithin Job, industrial engineering, and Pushpesh Sharma, chemical engineering.